photo-eye Gallery Gallery Favorites: Symbols, Sharks and Still Lifes from Maggie Taylor Maggie Taylor’s vivid photomontages are awash with whimsy, story, and symbolism. In this month’s Gallery Favorites segment we choose one image that personally speaks to each of us from Taylor’s exhibition A tale begun in other days, detailing what we find intriguing and delightful about each work. Maggie Taylor’s vivid photomontages are awash with whimsy, story, and symbolism. 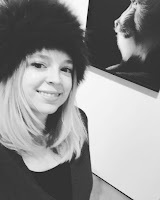 In this month’s Gallery Favorites segment we each chose one image from Taylor’s exhibition A tale begun in other days that personally speaks to each of us, and detail what we find intriguing and delightful about each work. 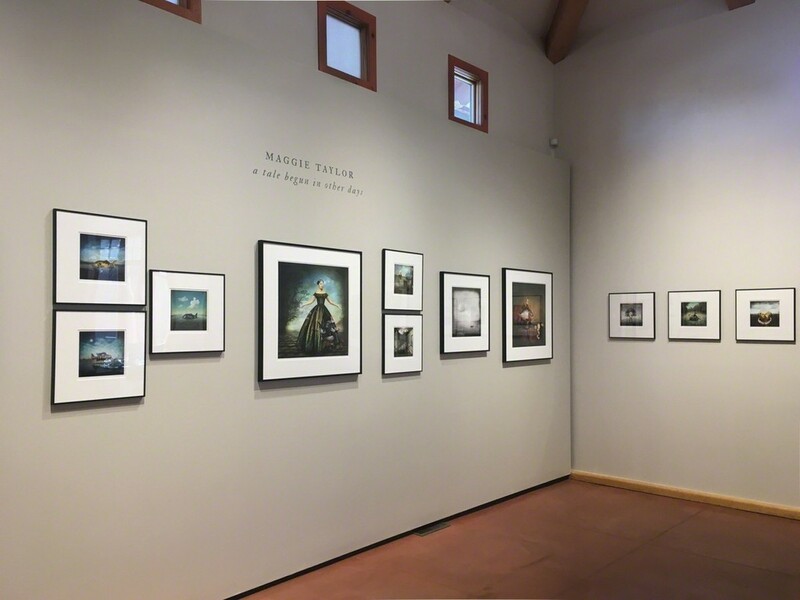 We hope you enjoy viewing our favorite prints from the exhibition and please reach out if you have questions about one of the selected artworks — Maggie Taylor’s A tale begun in other days is on view through September 9th, 2017. I have come to realize I gravitate toward images that blend whimsy, mystery and some type of ill-boding element. I also love open ended narratives, photographs that allow the viewer to formulate their own story, and Twilight swim by Maggie Taylor checks off all of those boxes. 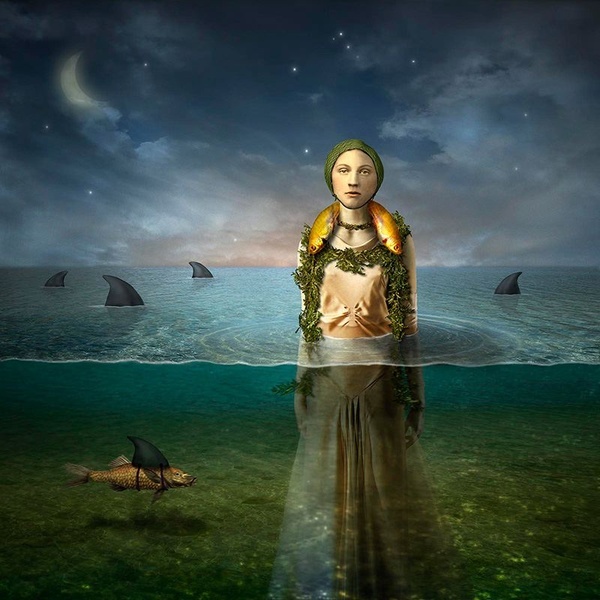 In this photomontage, we see a woman adorned in a fish necklace and long flowing gown standing in the ocean at night surrounded by sharks and one curious fish just to her left masquerading as one. Yet, this is not why I chose Twilight swim, I feel like this image chose me. I have always believed in intuition, that you just know it when you see it, and that is how I add to my personal collection. Now, by nature, I'm also an optimist, so I have chosen to believe that the woman will not be harmed because all the sharks are really just harmless fish pretending to be sharks – but this is just my interpretation. The 22 x 22" print of Twilight swim currently on view at photo-eye Gallery is the final print available in this edition and sold out in all other sizes. 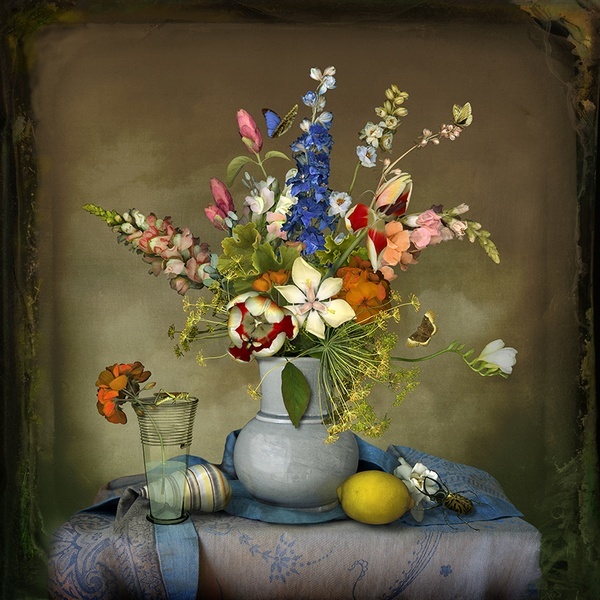 When discussing Maggie Taylor’s work with Gallery visitors, I am often asked, “Is this a photograph or a painting?” Her process is no doubt a recurring topic in the conversation, but more often it’s her remarkable imagination and fantastic use of color that is so captivating. For me, Later touches on all of these points. I’m reminded of a 17th-century Dutch painting, only slightly brighter, and more whimsical, in true Taylor fashion. 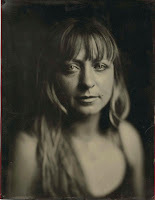 I’m also curious about the image’s border, similar to a tintype, but isn’t this a contemporary work? That is the question. Through her digital photomontage process and creative mind, Maggie breathes new life into established form, style and imagery. I love the delicate arrangement of the bouquet, her methodical use of insects, tapestries and the lemon – all objects rich in symbolism. You can converse about the meaning of this piece at length, or simply take in the sheer beauty of it. Taylor’s Later is inspirational and masterfully executed. 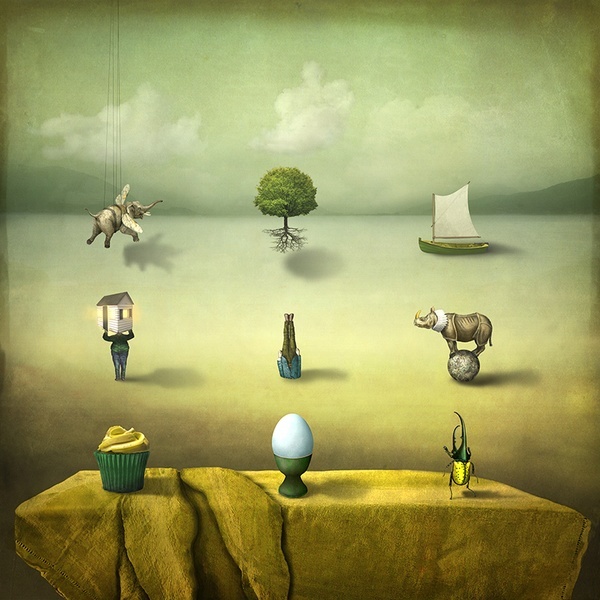 According to Carl Jung, “Language is originally and essentially nothing but a system of signs or symbols, which denote real occurrences, or their echo in the human soul.” In Before breakfast Maggie Taylor gives us just that, a system of 9 whimsical objects, animals, and vignettes neatly arranged in a matrix against a surrealistic backdrop; she presents a code that is deliciously cryptic. Admittedly I have a thing for semiotics, and delight in deciphering the meaning of the details, arrangement, and juxtaposition of each symbol – especially those as odd as a strung-up elephant with bee wings and a person with a house for a head (lights are on by the way, so that’s a good sign I guess). I particularly like the title, Before breakfast, lending the context of early morning on an empty stomach so hunger, half-dream states, and lists of the day’s priorities are all at play perhaps giving way to the fantastical scene before us. 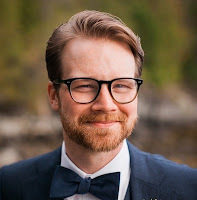 Like dreams, I feel the language Taylor speaks is both specific and vague, allowing viewers to bring their own experiences and interpretations to the table, so to speak, and ultimately crafting a complex and contemplative visual experience.